We’d love your help. Let us know what’s wrong with this preview of Conscious Parenting by Nataša Nuit Pantović. To ask other readers questions about Conscious Parenting, please sign up. I read 4 Nuit’s books. I read books about Parenting and Books about nutrition and cooking. In addition to concrete advice of the attitude towards children, daily routine, and healthy way of preparing food, I found how to become aware of my selves, and how to spend every day as a special gift from God. I learned how to develop creativity and joy of existence. Finally, after all, I woke up fulfill of love. I highly recommend books to anyone who wants to spend a better lifestyle and healthy time wit I read 4 Nuit’s books. I read books about Parenting and Books about nutrition and cooking. I highly recommend books to anyone who wants to spend a better lifestyle and healthy time with family, and learn how to live in harmony with nature and with God. I never liked parenting books, and always believed that experiences teach us much more than any book can when exploring the parenting world, yet I found Conscious Parenting the most amazing, inspiring course material that one could find around. Trust me, it is definitely worth going onto Nuit's parenting exploration journey, it is full of magic and true knowledge. Becoming a conscious parent is a challenge not all can take and it is a 'call' directed towards the future generations. If you feel that you belong to that future, as few of us do, get hold of the course, devote the necessary 12 weeks to its enfolding and learn through your-own experience. It is surely worth it! 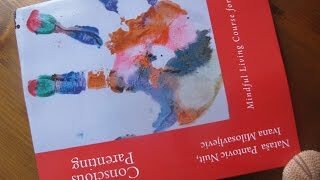 Conscious Parenting: Mindful Living Course for Parents by Natasa Pantovic Nuit is a great course and I highly recommend it! I enjoyed working with the kids on creativity exercises of various sorts. All kids these days are hyperactive and detached from the contact with nature so seeing the little ones working on some simple but inspiring exercises from the course, enjoying their creativity time, and preparing little surprises for me, their auntie, made us feel more as a family. The course is fun, full of exercises and tips for kids development. 12 modules try to cover all the areas within one's life, so there is much to enjoy but I would highlight: anger management, understanding core beliefs and of course relationships. Worth going back to it at different stages of life! I will probably re-do it again in a couple of years. Must try! 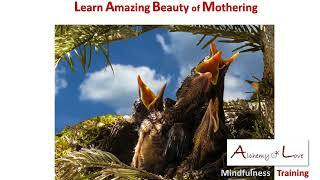 Conscious Parenting Course is Alchemy of Love Mindfulness Training Course published by Artof4elements. All through the mindfulness exercises of the Conscious Parenting Course, the parents are encouraged to listen to their Souls and to come back to love, awareness, consciousness hoping to inspire the parents capacity to stay Creative, Loving and Full of Energy. 'It is possible to get the art o Conscious Parenting Course is Alchemy of Love Mindfulness Training Course published by Artof4elements. 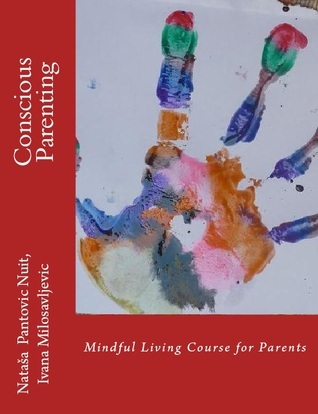 Conscious Parenting: Mindful Living Course for Parents by Natasa Pantovic Nuit is a book / course full of wisdom and beauty. I've read Mindful Being, Mindful Eating: Exercises with Delicious Raw Vegan Recipes and Chanting Mantras with Best Chords from the same author and really enjoy going back to Nuit's poetry Art of 4 Elements for inspiration within my day-to-day existence. The Alchemy of love books transfer me into a different space and level of existence, they bring me back my meditations, m Conscious Parenting: Mindful Living Course for Parents by Natasa Pantovic Nuit is a book / course full of wisdom and beauty. 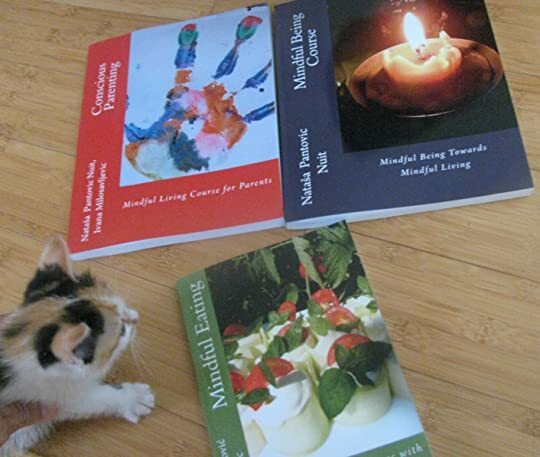 I've read Mindful Being, Mindful Eating: Exercises with Delicious Raw Vegan Recipes and Chanting Mantras with Best Chords from the same author and really enjoy going back to Nuit's poetry Art of 4 Elements for inspiration within my day-to-day existence. The Alchemy of love books transfer me into a different space and level of existence, they bring me back my meditations, my efforts to change the world, my dreams and they inspire me to live my highest potential. Whether it is with the choice of healthy nutrition, my constant reminder about my thought processes, the training of the feelings or the reminder to live within conscious relationships, Conscious Parenting Course took me on a journey of self discovery. I filmed my experiences and created various art-works while 'working' on the exercises recommended within the book. I followed my creative flow and got further inspired to live creatively. The synchronicity kept occurring within my life while I was focusing on various subjects. While focusing on compassion, my world was compassion and non-violence, the books that came to me during this week were about compassion and non-violence, and my life got a shape and color of virtues or meditations I was following. The book kept the beauty and the wisdom within a firm structure that at the end of the journey opened vast amounts of paths and further discoveries. Conscious Parenting Course ended with the module called: Spiritual Journey that invited all of us to start this amazing journey after we have finished the book exploration. From self-development into spiritual-development. Wow, what an invitation! A beautiful and inspiring book from Natasa Pantovic Nuit Conscious Parenting: Mindful Living Course for Parents. The book is designed as a course and it took me quite a long time to start doing its modules because the return to courses was not quite my theme. Yet, once the course took me in, I was absorbed, inspired and challenged by its rhythm and exercises. A beautiful wisdom and warmth surrounds each and every module, exercise, subject. It feels as though the content is mixed with this ingredi A beautiful and inspiring book from Natasa Pantovic Nuit Conscious Parenting: Mindful Living Course for Parents. The book is designed as a course and it took me quite a long time to start doing its modules because the return to courses was not quite my theme. Yet, once the course took me in, I was absorbed, inspired and challenged by its rhythm and exercises. A beautiful wisdom and warmth surrounds each and every module, exercise, subject. It feels as though the content is mixed with this ingredient of love and patience towards kids and their growth. We as parents are pushed into the competitiveness of today's world, the conscious parenting reminds us to slow down and trust the inborn wisdom of our little ones. The struggle is there, it exists as a true reality of parenting, and we parents have to learn how to grow with our kids, how to understand their 'unconscious' for the outsiders quite 'crazy' behavior. In my life, I found that I constantly lack the quality time for my partner, my kids, my parents, my friends, my hobbies. The time seam to speed up at all times, so I had to take off my watch, and learn about all the 'time-wasters' that lived within my life. Removing old habits and replacing them with the new ones that are healthy and empowering is always the most difficult part of the life equation. Nuit's course gave me the tools to keep me going for a life-time. Great push, great inspiration, great work, great self-development course. Conscious Parenting: Mindful Living Course for Parents from Natasa Pantovic Nuit is an Inspiring, Valuable, Worth reading course with Great tools. I never read parenting advice books because my opinion usually differs from the rest I am into green parenting, simplicity parenting, love parenting (if such a thing exists ), soul parenting, so I found Nuit’s approach to be just a great nourishment for the soul. Working on our self-development holistically and as a family we empower our kids with lo Conscious Parenting: Mindful Living Course for Parents from Natasa Pantovic Nuit is an Inspiring, Valuable, Worth reading course with Great tools. 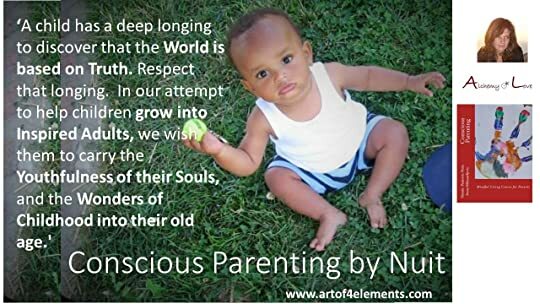 I never read parenting advice books because my opinion usually differs from the rest I am into green parenting, simplicity parenting, love parenting (if such a thing exists ), soul parenting, so I found Nuit’s approach to be just a great nourishment for the soul. Working on our self-development holistically and as a family we empower our kids with love, beauty and creativity. I found Conscious Parenting to be a very practical guide to day-to-day mindfulness game with some beautiful exercises. My work was challenging but inspiring. With Conscious Parenting we (our little family) followed the structure yet stayed firmly within the setting of freedom, followed the regular bed-time, healthy food, a proper exercise regime, and yet we were leaving lots of space for creativity, for games, for surprises, for love. Consacious parenting is a basis of self development of any human being. How our parents behave form the way we think, act, and that is why it is so important to understand how to properly educate our kids. Conscious parenting book is a must to read, examine, and deeper explore. I am an educator interested in Waldorf methods of education and I found the exercises to be practical, inspiring, motivating, full of day-to-day tips, wisdom and learning activities. Must read! Parenting is a much demanding chore, much tiring, especially if you are a single parent, but nothing is as much satisfying and so beautiful than this. I don't believe in the concept of an "ideal parent". It has to be a level higher than saying " It is my duty to look after them". Children are not commodities, they are beautiful souls, a gift from God. The psychology needs to be understood. A child has to laugh with you. You need to be as a good friend to them, making them share their thoughts an Parenting is a much demanding chore, much tiring, especially if you are a single parent, but nothing is as much satisfying and so beautiful than this. I don't believe in the concept of an "ideal parent". It has to be a level higher than saying " It is my duty to look after them". Children are not commodities, they are beautiful souls, a gift from God. The psychology needs to be understood. A child has to laugh with you. You need to be as a good friend to them, making them share their thoughts and views daily and intricately balancing them to make them channelize their energy in the right way. This course is fun, full of exercises and tips for kids development. 12 modules covering all the areas within one's life - I loved anger management, understanding core beliefs, personal development plan. great book. loved reading it. lot of insight and information that are useful for parents. I recommend it to all new parents. Nataša Pantović Nuit, BSc Economics, is Author, Management Consultant, and Spiritual Researcher into Higher States of Consciousness living and working in Malta. Author of 9 Mindfulness Books called Alchemy of Love Mindfulness Training. "Applying the Laws of Quantum Physics to Philosophy Mother of all Sciences and acknowledging that Micro Cosmos is deeply connected to Macro Cosmos we acknowledge tha Nataša Pantović Nuit, BSc Economics, is Author, Management Consultant, and Spiritual Researcher into Higher States of Consciousness living and working in Malta. - Yin and Yang Consciousness States of Universe are NOT positive nor negative. There are only negative and positive applications of Yin and Yang states of consciousness within Yin and Yang charged environment. Each one of us, as a soul incarnated to experience different states of Consciousness Manifestations, tries to understand the positive applications of Yin (Intuitive) combined with Yang (Reason) states of Consciousness. Applied together within what I call Alchemy of Love or Alchemy of Soul or Alchemy of Humanity these Forces direct us towards the implementation of Clear Ratio Guided by Intuitive Wisdom. This is the highest implementation of Intuitive (by definition Yin) Truth (by definition Yang) within Humanity's learning implemented so far. “I” as an individual know nothing and “we” as “humanity” or “Universe” as an entity know IT ALL. The full application of Yin and Yang Positive Forces will take us to a number of enlightenment-s within many fields of Life. Within Gaia, this amazing breathing ever-changing hermaphrodite environment, that is on Her own perfectly sufficient - Life flourished. Within her ever-changing atmosphere resonance is supreme. We as human beings at all times learn how to live within the Gaia’s environment. " In March 2015, Artof4Elements has launched the Alchemy of Love Mindfulness Training Series of 9 fiction and non-fiction books. authored by 7 authors, focusing on spiritual growth, creativity and mindfulness. A series of many genres, including poetry, personal development, historical fiction, the world of ''Alchemy of Love Mindfulness Training'' explores numerous self development themes.